Myung Ki “Mike” Hong has donated $2 million toward the establishment of two endowed chairs in UCLA’s department of chemistry and biochemistry. The gift will create the Dr. Myung Ki Hong Endowed Chair in Polymer Science and the Dr. Myung Ki Hong Endowed Chair in Materials Innovation. Both chairs will support scientific research with applications ranging from regenerative medicine to environmental sustainability. “As a proud Bruin, I am delighted to give back to the university and the department that gave me the foundation for my success,” Hong said. The gift is part of the $4.2 billion UCLA Centennial Campaign, which is scheduled to conclude in December 2019 during UCLA’s 100th anniversary year. Hong’s donation was matched by the UCLA division of physical sciences for a total contribution of $4 million. The match was made possible by a program established after UCLA sold its royalty interest in Xtandi, a compound for the treatment of prostate cancer that was developed by researchers in the chemistry and biochemistry department. With its share of the proceeds from the Xtandi transaction, UCLA has also made matching funds available for gifts that support undergraduate scholarships, graduate fellowships and research programs. Hong came to the U.S. from South Korea in 1954 as an exchange student and graduated from UCLA in 1959 with a degree in chemistry. He then worked at Whittaker Coatings for 22 years. 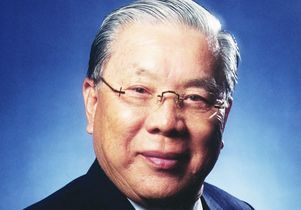 In 1986, he founded Dura Coat Products, of which he is still chairman. The company distributes industrial coatings in the U.S. and internationally. In 1992, after civil unrest in Los Angeles that followed the trial of police officers involved in the arrest and beating of Rodney King, Hong dedicated himself to promoting cultural understanding and tolerance. He served as chairman of a foundation dedicated to preserving the memory of Dosan Ahn Chang Ho, an early leader of the local Korean-American immigrant community. Hong reconnected with UCLA when he delivered the chemistry and biochemistry department’s commencement speech in 2015. The department was ranked No. 7 in the world in chemistry by U.S. News and World Report in 2016. Three faculty members and four alumni have been awarded Nobel Prizes in chemistry. The department has more than 50 faculty, 130 postdoctoral researchers, 350 graduate students and 1,400 undergraduate majors in biochemistry, chemistry and chemistry materials science.